In honor of her unofficial run in 1966, Bobbi Gibb (right) was given the 2016 trophy by winner Atsede Baysa. Fifty years later — to the day — Bobbi Gibb got her trophy. 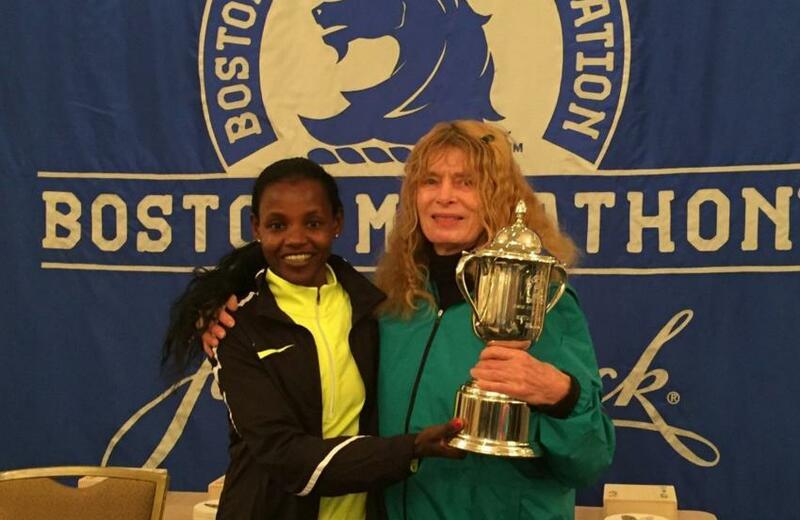 Atsede Baysa, the first woman Monday to cross the finish line of the 2016 Boston Marathon, presented Gibb with the champion’s trophy Tuesday morning at the Fairmont Copley Plaza hotel. Gibb, moved to tears, accepted — with one condition. In a year, Gibb said, she’ll go to Baysa’s native Ethiopia and return it to her. Baysa wanted to make the gesture Monday night at the awards ceremony, but Gibb was not present. Baysa had learned about Gibb’s story — how, on April 19, 1966, she became the first woman to run the Boston Marathon, at a time when there was no women’s division and females were considered by many to be physically incapable of running 26.2 miles — and wanted to meet her. That introduction came Tuesday morning. Minutes later, toward the end of a day-after race briefing with the media, the trophy handoff happened. “I want to dedicate this trophy to her because she’s an amazing woman,” Baysa said through a translator. The 50th anniversary of Gibb’s run was a theme of this year’s marathon festivities. Gibb served as the grand marshal of the race. More than 12,600 women started the race this year, and more than 12,100 finished. According to the Boston Athletic Association, more than 175,000 women have completed the race in the last half-century. It all started with Gibb. “It’s just what I wanted,” said Gibb, 73. “I wanted to show that men and women could do things together and end this war between the sexes, and show that we can all be individuals and try what we love and do what we love and we don’t have to be restricted by these stereotypical boxes. Outside the hotel, remnants of the race lingered around the Back Bay, from a crew breaking down the tent next to the Boston Public Library to people wearing green Boston Marathon windbreakers. The neighborhood slowly returned to normal, much as the race itself has. Race director Dave McGillivray, without explicitly mentioning the 2013 finish-line bombings, acknowledged that the 2016 marathon was another step forward. Logistically, everything went smoothly. No surprises, no problems. Any Marathon Monday like that is a welcome one. According to Chris Troyanos, the BAA’s medical services coordinator, the relatively warm weather — with temperatures creeping into the 70s, but getting cooler toward Boston — caused some issues, but nothing major. Medics treated 2,320 runners, 8.4 percent of those who started. Of the 87 transported to hospitals, nine remained as of Tuesday morning. All were expected to be fine.